The petition page set up by nursing student Lucy Spencer. A university has confirmed it will be making one of its learning disability nursing lecturers redundant. RCN Wales said it was 'bitterly disappointed' by the decision by Bangor University, warning it will have a devastating effect on students and patient care in north Wales. Bangor had said it needed to cut £775,000 from the School of Health Sciences budget by 2022 as part of a wider exercise. It said the learning disability nursing course had not been recruiting sufficient numbers in recent years. The decision means the learning disability team will be cut from 2.5 full-time-equivalent lecturers to two. The university says this would maintain the agreed minimum staff-to-student ratio of 1:17 across all nursing courses. Almost 900 people recently signed a petition organised by first-year learning disability nursing student Lucy Spencer in protest. Ms Spencer said she and fellow students were 'absolutely devastated' by the news. A Bangor University spokesperson said: 'In response to the challenging financial landscape facing the higher education sector in the UK, we have concluded a period of consultation with staff and students regarding a number of options which will enable the university to meet its financial targets. The number of places commissioned for learning disability nursing degree programmes at Bangor was 20 for 2019-20. RCN Wales director Helen Whyley urged the university to reconsider. 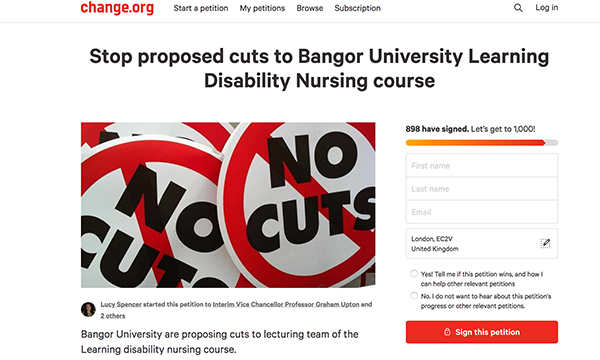 She said: 'How will Bangor University be able to encourage learning disability nursing students to apply for places, without enough learning disability nurse lecturers providing the proper level of academic support? 'It takes a significant amount of time to produce a lecturer who can undertake world-class research and also educate nursing students. 'Bangor University has an excellent learning disability team and reducing this will only produce negative consequences for the learning disability nursing workforce.